New Delhi: To celebrate International Day of Peace, Amity University in association with Global Peace & Prosperity Initiative India on behalf of Global Peace & Prosperity Initiative, USA, organized International World Peace Week which concluded today at University campus, Sector 125 Noida. During the occasion, thousands of Amity students, faculty members and staff of Amity University took a peace pledge to maintain and spread message of peace across the globe. PadmaShri, Shri S.P. Verma, Vice President, Gandhi Global Family; Prof. (Dr.) Anil Dutta Mishra, Eminent Gandhian Scholar, Former Deputy Director, National Gandhi Museum, New Delhi; Dr. Alok K. Mishra, Chairman of Brain Behaviour Research Foundation of India (BBRFI); Dr. B.K. Binny, Regional Director, Peace & Prosperity Initiative – India and Dr. Ashok K Chauhan, Founder President, Amity Education Group were present during the occasion. 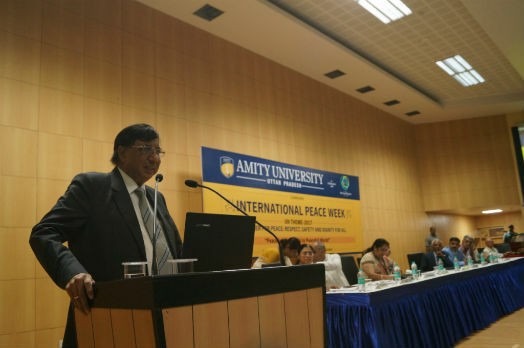 Dr. Ashok K Chauhan, Founder President, Amity Education Group said that peace is very important in every individual’s life and overall well-being. He averred that many lives are affected due to violent or other kind of conflicts and the only solution to stop the negativity is by promoting peace across the globe. He apprised that International Peace Day has been celebrated in Amity with an objective to spread the message of Peace, Respect, Love, Safety, Dignity and Prosperity amongst Amitians who will further bring a positive change. Welcoming the guests, Dr. (Prof.) Balvinder Shukla, Vice Chancellor, Amity University said that every person on earth is seeking peace and if a person wants to live in a peaceful environment then he or she must create the same environment they wish to live in. She mentioned that it is important to find mistakes within and rectify them which is a positive way to bring change in society. She stressed that thoughts translates into words and action which further creates a wave in society, hence it is necessary to assess one’s thoughts as it determines the positive or negative equilibrium we create in society. Addressing the gathering, PadmaShri, Shri S.P. Verma, Vice President, Gandhi Global Family said that world is in a turmoil with unrest in every nation and it is the duty of the young generation to prepare themselves as global citizens and bring a peaceful change. He apprised that war is on to destabilize the world peace and there are less numbers of peace activists to cease it. The only way to help the world is through people’s movement. He called upon the gathering to be part of the movement for a common mission towards peaceful world. Mr Verma pointed out that the thoughts of Mahatma Gandhu Ji is the workforce behind the peace movement and stressed that peacemakers are now looking towards India to further promote the ideology of Mahatma Gandhi. 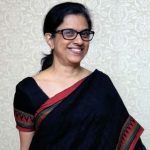 Sharing her views, Dr. B.K. Binny, Regional Director, Peace & Prosperity Initiative – India said that The International Day of Peace was established in 1981 by the United Nations General Assembly and two decades later, in 2001, the General Assembly unanimously voted to declared this as a day devoted to strengthening the ideals of peace, both within and among all nations and peoples. She called upon the students to be the ambassadors of peace and advised them to commence their day with a good thought as peace begins within and human beings promote what they believe in. Speaking on the occasion, Dr. Alok K. Mishra, Chairman of Brain Behaviour Research Foundation of India said that in present time, the nations are divided in pursuit of individual development but it is necessary to understand that peace cannot be obtained through power of a nation but by overall development of mankind with brotherhood. During the occasion, Brother David from Australia for World Peace and Harmony; Mr. Shaun Parry, USA- Artistic Director & Presenter at World Parliament on Spirituality and students of Amity Institute of Psychology And Allied Sciences presented a mesmerizing cultural programme.